Choosing a puppy from a litter isn’t the easiest task. The variables are limitless… Are you a purebred markings snob? 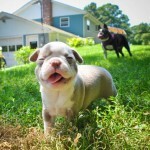 Are you looking for “personality?” Is the pooch just plain cute? How does Fido get along with Mom or siblings? Will he take to you? A few weeks ago, Mike, Ella and I drove up to Vermont to visit our new puppy’s breeder. It was time to choose which pooch we’d like to take home. There are dogs everywhere. The breeder and her husband have 4 adult Bostons. Very friendly and active pooches. The two moms of the bunch whelped litters roughly a week apart from each other… 11 or 12 puppies all together. A giant bundle of cute. Gets better. 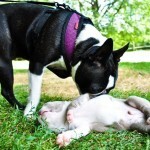 Is your image of a Boston Terrier the ubiquitous black and white, with tuxedo-like markings? Our Ella is, with a slight off-center blaze of white between her eyes. Gingy and Holly (the moms) have red and white coats. Somewhat unusual in Boston circles. More unusual is 3 of Gingy’s pups are champagne and white. Beautiful. Unique. 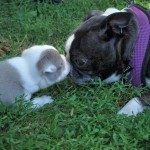 When searching out a breeder to add to our family, we came across Laurie and her champagne Boston Terriers. We fell in love. That excitement peaked once we arrived in Vermont to meet the pooches. We had already decided on a champagne boy, and placed our deposit, securing us 2nd pick of the litter, of which 2 champagne boys remained. This was both the same and completely unlike the process choosing Ella as ours. She was one of a litter of three, with the first pick staying in the breeder’s family. We chose from 2 girls. The difference with Duke (our little boy’s name) is we got to play with him and his champagne brother, and also with the other 10 or so puppies (all red and white coats). We wanted to take them all home. Imagine all these month-old puppies, only beginning to discover their world. We sat for hours talking with Laurie and enjoying the pups. We couldn’t decide which of the two we liked best. One has a diamond-shaped marking on his head (a traditional sign of good blessings for the breed), the other has the most adorable white-tipped and speckled ears. We just can’t decide. Ella snoozing in the car, we knew what our next choice would be. Let her pick her new brother. Would it work? How would she react to these tiny dogs? Would a motherly instinct kick-in? With the two boys exploring the grassy outdoors for the first time, I led Ella over on leash, very cautiously easing her into the scene. She immediately took to one, sniffing him all over and not just “where dogs sniff each other.” This went on for an hour, half interested in this particular puppy the rest of her time curious about nearby horses and roosters. She practically ignored the other dog, eventually getting curious enough to visit. We were sold. Mike and I were evenly split on which dog we liked. We let Ella cast the tie-breaker. We crowdsourced our puppy. Little Duke. Have you cracked the social measurement code? If you tweet it, will they come?